MR.BOND X Folding Drying Rack from Xiaomi Youpin - WHITE w cenie $39.99 | Chińskie kupony rabatowe, zniżki i okazje! MR.BOND X Folding Drying Rack from Xiaomi Youpin – WHITE! Teraz w promocyjnej cenie $39.99 Cena regularna to: $41.99, zaoszczędź i skorzystaj z kuponu na gearbest! 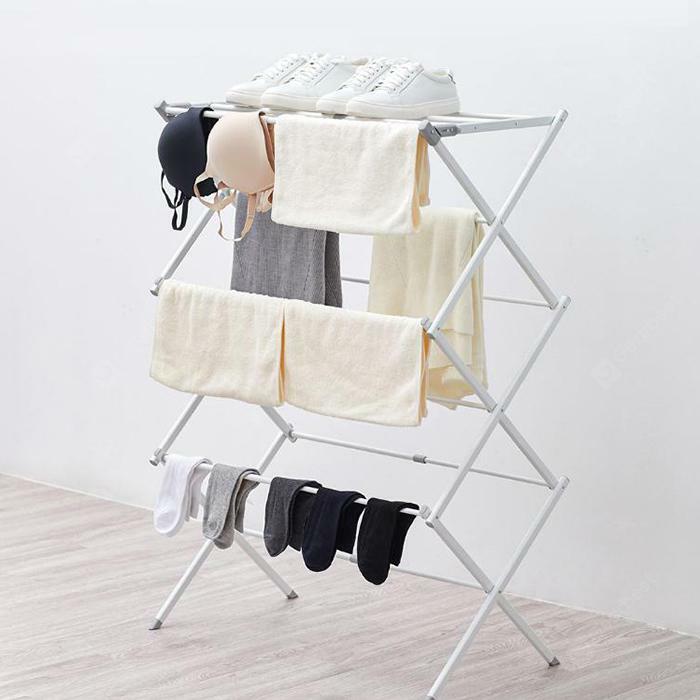 • MR.BOND X foldable drying racks, reasonable use of vertical space, three-layer drying of the main body, saving three times the lateral hanging space, while carrying more drying possibilities. • Easy to store in the corner of the house. When you use it up, you can have three layers of clothes drying space; after folding, the frame body is only 9cm thick, which can be easily stored in any corner of the house. • The drying rack has a three-story space frame with a total of 11 drying rods. • It has an oversized drying capacity and can withstand 7.5kg of daily clothes. It can spread a lot of socks, diapers, underwear, towels and other clothes. • The scientific calculation is 35cm. Even if you are full of clothes, they will not block each other and be more efficient. • Silk, wool and other materials are easy to wrinkle and wear, use clothes to dry, clothing is easy to support of strong deformation; smooth and flat clothes rod, so that precious fabrics can be spread flat, after drying, clothes are no trace, Soft and natural. • A 43.5cm drying rod can be used to spread a T-shirt ( 10 pieces can be aired as a whole ), and can be pulled to 75cm when needed. • The main body of the drying rack is made of Q195 carbon steel pipe frame. • The overall weight of the drying rack is about 2.33kg, which is equivalent to the weight of 5 bottles of 500ml mineral water. It is light and portable.